I think you would have got the gist by now that I loved my time in Alaska. LOVED it. The State is full of the most naturally beautiful places I have ever experienced, the wildlife is varied and plentiful, the hiking in Alaska is incredible and the people are quirky and awesome. What’s not to love? But as much as I enjoyed everywhere that I visited in Alaska, I can still readily tell you my favourite place: it was Sitka, hands down. Leaving behind rainy Juneau, I took the ferry four and a half hours to Sitka past breaching whales and island coastline with log strewn pebble beaches and heavily forested interiors. What a way to travel! Low mist hovered a few metres above the water but the rain of the past few days had finally stopped. I would take what I could get. As we pulled into the Sitka Port I was excited. I had only heard good things about this town and I was looking forward to discovering if it lived up to the hype. Turns out it did, and then some. Sitka was first settled by the Tlingit people 10,000 years ago and their culture is still richly embedded in this place, along with the heavy Russian influence from when Sitka was known as New Archangel, the capital of Russian America. There is only one hostel in Sitka and like the hostel in Juneau, the Sitka International Hostel has a lock out policy during the day. As we arrived reasonably early, we left our bags at the Fire Station until we could check in later in the evening. I am not a big fan of this policy but I do understand why they do it. It keeps costs down and it means they don’t need as many volunteers to have to staff the hostel at all hours. Luckily, unlike Juneau, I had beautiful weather for most of my stay so the lock out was a non-issue: I was out enjoying the sunshine. Other than the lock out, I absolutely loved the hostel. It was big and cosy with friendly staff and it was within walking distance to pretty much everything. I ended up with a cool little group of friends and we spent our time together exploring Sitka and the surrounds. Everything came together better than I could have hoped for. As I had only booked last minute due to my Help X placement in Haines falling through, there were only three nights available and then the whole place was booked out for a few days. I really wanted to stay a fourth night though so I put off booking my flight down to Seattle and kept asking every day if there had been any cancellations. In the end the Manager kindly let me stay in my own double room for the same price as a dorm bed for my last night. It was a room that was set aside for an incoming volunteer that wasn’t arriving till the day I wanted to leave. I really lucked out with this and I was so happy I was able to stay longer. Exploring Sitka on my first day was a cold business. The rain may have stopped by the temperature was still a lot lower than any temperature in summer should be. But despite this, Sitka still worked its charms on me. I was really lucky that I had three days of sunny skies in a row after that first day, not common in this particularly rainy part of Alaska. Sitka is just a delight to stroll around, in any weather, but sunshine is always preferable. Located on Baranof Island, Sitka has a simply beautiful setting with mountain views and a harbour dotted with small forested islands. It doesn’t get a large number of cruise ships coming through so it has the more authentic feel of a real town as it is not catering to tourists to a large degree. It has so much life to it. Sitka’s quiet streets are home to cute cafes and tasteful souvenir shops and there are numerous Russian buildings that have been preserved from when Sitka was the Russian American Capital. My favourite Russian building is the Cathedral of St Michael with its green domes and gold crosses. I saw a bald eagle with wings spread out sitting on the top of one of the crosses one day. It was perfectly still and I thought it was a statue until I saw it move slightly. The original cathedral was the first Orthodox church built in the New World. The current building was built in 1966 after the original was destroyed by fire. Luckily most of the artefacts inside were able to be saved by locals before the building burnt to the ground and are now housed in the new cathedral. Castle Hill is now just a small hill offering beautiful views over the harbour, but it was once the home of a Russian Fort and was where Russian Alaska was formally handed over to the United States. There is a Russian Blockhouse on another hill that is a recreation of a guard tower that made up part of the fortifications that surrounded New Archangel. 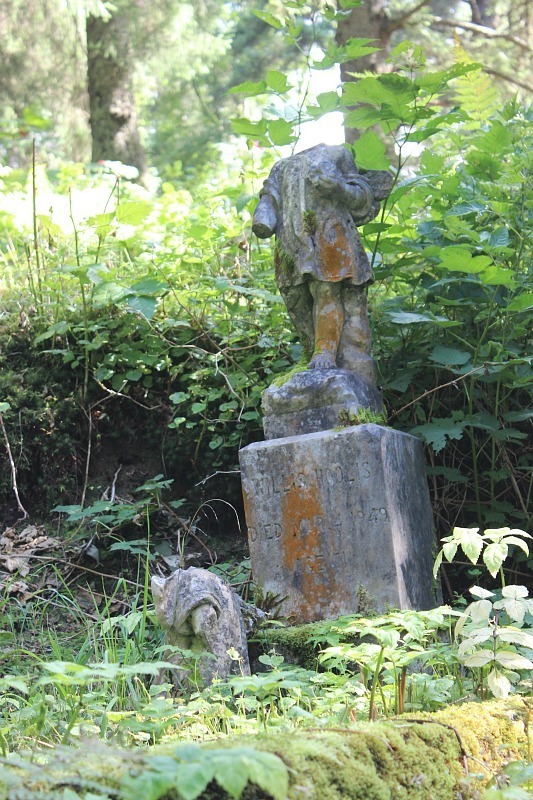 Sitka’s Russian cemetery is one of the coolest I have visited, and I have visited a lot. It is a dark and overgrown wonderland of narrow pathways choked with moss and ferns and too many creepy headless angel statues to count. The ground is uneven and soggy with many gravestones half sunken into the earth. It is 200 years old and is home to over 1600 graves. Along with discovering Sitka’s Russian heritage, we also delved into the Tlingit culture which is still very much alive and celebrated in Sitka. To learn more about Tlingit culture we headed to the Sitka National Historical Park/Totem Park, a peaceful island of spruce and hemlock forest that is home to a collection of towering Tlingit and Haida totem poles. It was also here in 1804 that a battle took place between the Russian Traders and the indigenous Kiks.ádi Tlingit people for the ownership of the land. Although initially the Tlingit drove off the Russians, they were defeated in a second attack and were forced to leave their ancestral lands and establish a settlement on neighbouring Chichagof Island. The Sitka National Historical Park Visitor Centre has an informative film about the battle as well as historic Tlingit and Haida totem poles that were collected in 1904, and many historic photographs. We were also lucky enough to be able to experience a traditional Tlingit dance with singing. They performed a number of dances with animal and bird head pieces and capes that represented the Tlingit Gods, with each dance and song accompanying it telling of a different legend. I feel like I learnt so much about the history of this small corner of the earth in a short amount of time in Sitka and as an avid history lover, I loved how accessible history is here. As much as I adore history, I love nature even more and as I mentioned earlier, Sitka has beautiful scenery in spades. The harbour is a key component of what makes Sitka such a stunning little city and I spent a lot of time there during my visit. With a walking path lined with colourful fireweed, you can pass the many boats at the marina and see the salmon jumping up the fish ladder, sometimes even seals waiting near the entrance for an easy meal. One day when I was walking past the marina with my hostel friend Sarah, we saw the most gigantic sea lion I have ever seen. This thing was a monster. One local told us not to get too close as they have been known to pull people in. I don’t know if she was pulling our legs but I wasn’t about to find out. The Indian River begins from the harbour and flows beside the Sitka National Historical Park. It was full of chum and pink salmon spawning during my time there, with the best place to see them from the Arched Bridge in the park. This attracted a lot of bald eagles that were looking for an easy meal. I was amazed by how many of the majestic birds I saw during my time in Sitka. In fact there are so many bald eagles in Sitka at this time of year that locals joke that the bald eagles are to Sitka what pigeons are to New York. The absolutely best way to experience Sitka’s harbour is to get out on the water so that’s exactly what I did. Me and a couple of girls from the hostel went on a two hour guided kayaking tour around the harbour. We weaved in and out of small, green islands with rocky shorelines. Bald eagles perched high in the trees and curious seals passed by our kayaks. I had been admiring a photogenic red and white lighthouse that is perched on a rocky headland on one of the islands and we passed close by it. Turns out it is a fake. It is actually a guesthouse built to look like a lighthouse. I was disappointed. It was great to be out on the water again and our guide was fantastic, very enigmatic and knowledgable. Of course I did some hiking too. We wandered the paths in the Sitka National Historical Park on numerous occasions as well as hiking part of the Indian River loop which took us along boardwalks and across swing bridges, through the dense south east Alaskan rainforest. The river was thick with salmon, writhing together in one big mass of fish. My favourite hike was up Mount Verstovia which after a tough slog up a steep and muddy trail, afforded us incredible views of the surrounding harbour, mountains and fjords as well as Sitka’s town centre. That was so awesome that it deserved a separate post. Along with being culturally rich and incredibly beautiful, Sitka is also home to such friendly, vibrant people and the best place to meet some lovely locals was the weekly Farmers Market. It’s not a large market but it is bustling with life. A Ukelele band played while we perused the stalls, stocked with various locally-made handicrafts and local produce. Everywhere we went we were greeted by warm smiles and pleasant conversation. We indulged in fry bread smothered in butter and icing sugar and finally found out what black cod tips, a Sitka specialty, actually is (it’s the neck muscle – hmmm). Luckily we had already tried them from Ashmo’s Food Truck the day before and liked them as I don’t think I would have eaten them if I knew what they were first. It felt like everyone came together at the market, tourists and locals alike. We also encountered friendly locals at the excellent Baranof Island Brewing Company, where Sarah and I sat in the sun and sampled a few of the local craft beers including the unusual but delicious Sitka Spruce Tip beer. I think you can tell what kind of community spirit a place has by the way they treat strangers. And we were treated like royalty by everyone we met. I bet Sitka is a fantastic place to live as well as visit. Maybe I will find out for myself one day. Sitka is an all-rounder and an absolute must to visit in Alaska. Please don’t miss it, this little city is truly something special. We are headed to Sitka on Friday! Super excited for the trip 🙂 I am gonna have to save this post for reference while we are there. Did you hit up Kodiak in your Alaskan travels? Have fun Dara – love that little town! I didn’t make it to Kodiak but I have heard it’s amazing – it’s definitely on my list for next time. I lived there when I was a kid. It is probably one of my favorite places ever. You should go if you ever get the chance! Thanks so much for sharing! We’re heading to Sitka next week and I’m so excited. I can’t wait to check it out.